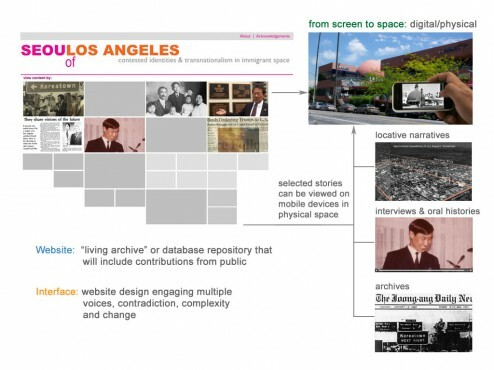 Situated at the intersection between new media practice and interdisciplinary scholarship, The Seoul of Los Angeles: Contested Identities and Transnationalism in Immigrant Space is a platform for community storytelling presented as an interactive online cultural history integrating locative media technologies. It looks at the sociocultural networks shaping immigrant communities and how local neighborhoods negotiate a sense of place within an increasingly globalized culture. Nicknamed the “L.A. district of Seoul City”, this work examines Los Angeles’ Koreatown through an excavation of its layered cultural history and an exploration of its ethnically diverse, predominantly non-Korean immigrant inhabitants. By looking at the tensions between how community members, state institutions, and grassroots organizations in Koreatown define and represent cultural identity, this study examines how conceptions of ethnic affiliation have changed, and how a homogenous sense of national identity is destabilized in order to create a more complex sense of being not only for Koreans but for the diverse communities with whom they interact. This study shows the impossibility of understanding immigrant communities along the lines of a singular nationality since ethnic identity embodies a more complex network of racial, historical and cultural affiliations that include, but are not solely defined by nation. Below are excerpts from interviews describing how the City of Los Angeles and members of the Koreatown community created the beginnings of this immigrant space. These are part of a larger project that asks how national culture is both constructed and lived, looking at how a sense of place is created for transnational inhabitants of Los Angeles’ Koreatown. Emeritus Professor of Sociology at Cal State L.A., Eui-Young Yu has been studying the Korean American community in Los Angeles since his arrival in 1968. Here, he describes the history of Korean immigration to the city in the early 1900s and the establishment of important cultural organizations along Jefferson Boulevard marking the beginnings of “old Koreatown”. Susan Ahn Cuddy, the daughter of the renowned leader of the Korean Independence Movement and civil rights activist Dosan Ahn Chang Ho, describes the Korean community in Los Angeles in the early 1900s. Hi-Duk Lee moved to Los Angeles in 1968 and opened Olympic Market in 1971 – one of the first Korean markets in the heart of contemporary Koreatown. Then, in 1975 he built the VIP Palace – a restaurant and nightclub on Olympic Boulevard designed to reflect traditional Korean architecture with roof tiles imported from the motherland. Together, these businesses marked the symbolic beginning of the contemporary neighborhood that is known as Koreatown today. David Hyun was a 2nd generation Korean American architect who is best known for designing the Japanese Village Plaza in Los Angeles’ Little Tokyo. Following the success of this project in the early 1980s, Hyun was approached by members of the Korean community to design a similar redevelopment project in Koreatown to be named “Korea City”. Hyun’s son, David K. Hyun is shown here describing the history of his father’s unrealized plans for “Korea City”.